Hi everyone. 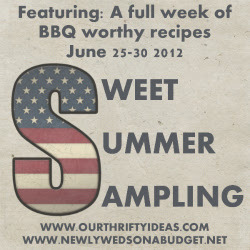 I’m joining up with Newlyweds On a Budget and Our Thrifty Ideas for their fun BBQ recipes week. Click on over to see my recipe for Tollhouse Pie. If you’re visiting from the Sweet Summer Sampling, welcome it’s great to have you. I hope you’ll peek around. You can see a list of some of my most popular posts in the right hand column and I hope you’ll stop by this even when the new What We Wore, Read and and Made Wednesday link party will go live. I’m so excited that Kari and Vanessa asked me to be a part of their fun BBQ series. Today I’m sharing with you one of my go to take to a BBQ recipes. This Tollhouse Pie is pretty much a chocolate cookie lovers dream. It’s especially good warm and you can re-warm it by throwing it in the oven or the BBQ for a couple minutes when you get to your hosts. Take along some vanilla bean ice cream and you’ll be making a bunch of friends. Add flour, sugar, and brown sugar and stir to combine. Add chocolate chips and any extras and vanilla. Stir until combined. Bake at 325 F for about an hour and 15 minutes until it looks set. This also keeps well and makes for great left overs when zapped in the microwave by the piece for about 30 seconds. I may or may not have been having a piece every day for breakfast last week. Just saying. I have never heard of tollhouse pie before. Looks good. This pie looks too good to pass. Simply delicious, and I looooooooove sweets. This recipe is a total flashback for me. I remember this as a kid. Can’t wait to make it. I will pin it. Please share this on my foodie friday party today. Thanks. This looks awesome! Great pics! We’d love to have you join us at Saturday Show and Tell @ Cheerios and Lattes! From looking through my site, I know my readers would love your ideas too! Have a great weekend! MmmM – this looks so good. Thanks for linking up at Romance on a dime! Pinning this. Chocolate always catches my attention! Thanks for sharing your recipe!